What is it about Raja Ampat that sees underwater photography enthusiasts instinctively flock there, like the swallows of Capistrano? What convergence of factors is there that means there is such a range of fascinating marine subjects? Why is Raja Ampat such a treasured dive destination? The region of Raja Ampat has seen a great deal of tectonic movement, bringing together various biological and geological elements. Fluctuations in sea levels have created barriers and bridges, allowing for multiple evolutionary avenues to evolve and spread out. Also the waters here have enjoyed warm temperatures for a very long time and many species here have very short larval periods, making the seas burst with life. Lack of river run-off and low human impact also help make for high quality water conditions. Such numbers are dizzying. New species are being discovered all the time, many of the endemic species being named after pioneers of the area. Some endemic species include: Erdmann’s tilefish, Ammer’s dottyback, the Raja goby, the Papuan garden eel and Papuan ornate pipefish. Raja Ampat is home to an amazing density of life. There are lots of fish and other marine creatures here, so photographic opportunities abound. Pygmy seahorses cling in numbers to gorgonian fans, anemones play home to crabs and shrimps, crinoids shelter clingfish, and squat lobsters and whip corals often have a little coral shrimp or two on board. Check the habitats. Your chances of finding subjects in Raja Ampat are excellent. In Raja Ampat you will dive in caves and caverns, over reef flats and sandy slopes, and around pinnacles and rocky outcrops. So you can take photographs of the big fish action in the north, or the bright colourful reefs of the south bedecked in soft coral and busting with life, and in the muck diving sites and mangroves of Cenderawasih Bay. You’ll be switching lenses a lot! For many camera-toting divers, Raja Ampat is something of a career high. Some old school photographers having been coming here since way back in the day, when photoshop was a place you went to buy film. What does it take to be a ‘good’ photographer? Let’s be honest: the moment a camera is involved the experience of diving is changed. Now it becomes all about the shot. Many can achieve this without damage to reef or molestation to creatures. However, often that is sadly not the case. Many underwater cameramen do not have the diving skills or proprio-sensitivity required to perform the job properly. Ensure neutral buoyancy so if you need to hang in the water column adjusting your rig you can do so without dropping into the abyss or requiring a guide to hold your tank. Don’t be so focussed on fiddling with your camera that you descend onto a reef, clattering all over the corals and reef top. Always check where your fins and elbows are likely to be if you must get into a close-to-lying position on the substrate. If there is something sensitive there, decide on another position. If you must have an anchor point to hold onto, select it very carefully. Look for an area of exposed rock or a patch free of damageable lifeforms. If you can’t find one be prepared to abort. When a fingertip or a finger and thumb will suffice don’t grab a handful. 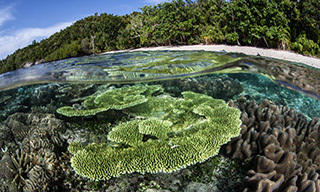 If you insist on checking your images after each snap, try to do so without kicking coral as you move away from the reef. Instead, move away safely first, then start checking. How hypocritical that many dive operators have a no gloves rule, yet they happily allow any joker with an open water cert and 35 dives to take down a colossal set of equipment, which controls them more than they control it! So forget the certifying agencies and the operators, the responsibility is yours. Now go take some fab pics, the best photographs you can without injuring any marine life. 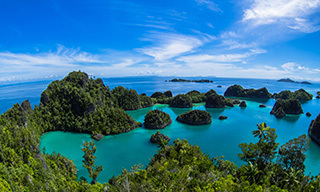 Source for quotes on Raja Ampat: ‘The Raja Ampat through the lens of…’ – Initiated by Max Ammer, co-published by Conservation International and The Raja Ampat Research and Conservation Center.